Ready for summer solstice?! June 20, 2012 marks the first day of summer and the longest day of the year. Here are some fun summer solstice party ideas to enjoy as a family. First you’ll want to decide when & where you will have your party. Hosting a barbeque at home seems like the perfect way to kick off the summer. Next you’ll want to tell your guests about the party (be sure to give them plenty of notice). Now it’s time to plan you party decor. For this task, you’re going to want to visit Amanda’s Parties To Go to find the free printable summer collection. 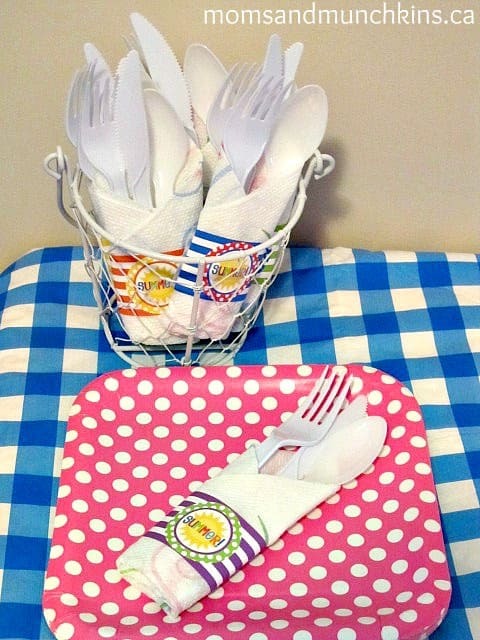 She has great free printables for napkin rings, bubble wrappers and favor tags. I’m sure you can think of even more great ways to use these fun free printables! Your local dollar store is a great place to go to find inexpensive summer-related party supplies like paper lanterns, outdoor lights, tablecloths, and more! Next on your summer solstice party checklist, you’ll want to come up with some delicious food ideas. Here is a link to the Moms & Munchkins recipe page that is filled with delicious recipes for appetizers, desserts and more! Once you have your time, location, decorations and food planned out, you’ll want to start thinking about activity ideas. If there will be kids at your party, you’ll want to plan some interactive games for them to enjoy together. Now you can sit back and relax while enjoying a fun afternoon with your family and friends. What are your favorite summer activities? Do you attend any summer solstice party events in your city? Have fun! I hope you have a fabulous summer! For more fun ideas to enjoy with your family, follow us on Facebook, Twitter, Pinterest and Bloglovin’.